As a storyteller, I'm always on the lookout for new books or stories to add to my repertoire of established favorites. When you find a picture book that really clicks, it's such a wonderful feeling. How Chipmunk Got His Stripes by Joseph Bruchac, and Beverly Billingsly Borrows a Book by Alexander Stadler are two of my standbys. Even better is when I run across that rarest of finds: a book that leaves me feeling like I could sing. (I am deliriously unmusical.) Let's Play in the Forest While the Wolf is Not Around by Claudia Rueda has been one of my favorites for several years. With Pete the Cat, Litwin and Dean have achieved children's librarian nirvana. This is, literally, a perfect book, for reading and singing aloud. Large, bright colored illustrations which are easy to see from across the room, a catchy tune that kids will quickly pick up and sing along with, an introduction to colors paired with a cheerful, optimistic message and a sense of humor. This book has it all. I'm buying multiple copies and hoarding them against the day that this wonderful gem ever goes out of print. I could go on, but I think the following video with the author and illustrator singing demonstrates exactly how magical this book really is. Oh my gosh- that is too funny. Definitely a cute story for little ones, and I couldn't stop laughing at the guy on the side of the stage who was just standing there holding the book. "Children's librarian nirvana." Love it. 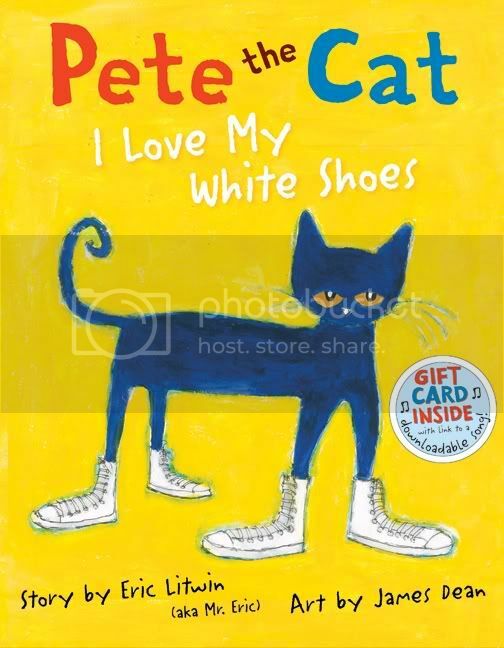 My love for Pete the Cat knows no bounds. I know, really. I'll never tire of this book - it is amazing.